Actually, as Winston well knew, it was only four years since Oceania had been at war with Eastasia and in alliance with Eurasia. But there was merely a piece of furtive knowledge which he happened to possess because his memory was not sufficiently under control. Officially the change of partners had never happened. Oceania was at war with Eurasia: therefore Oceania had always been at war with Eurasia. The enemy of the moment always represented absolute evil, and it followed that any past or future agreement with him was impossible. No Russian troops are massing on U.S. borders. The Russian government makes no threat against the United States. The claim is that the Russians—either the Russian government or certain individual Russians—are exercising a kind of mind control over Americans. Russian agents allegedly denied Hillary Clinton her due share of the 2016 President vote and allegedly manipulated President Trump into being less anti-Russian than he should be. But even if all the Russiagate charges are true, which I doubt, what the Russians have done is no different from what the old Soviet Union did, and what the United States continues to do down to this day. During the time Vladimir Putin has been in office, it is the United States, not Russia, that has announced policies of “regime change” against countries that never threatened Americans. It’s interesting that congressional Democrats, who say that President Trump is an insane clown, an ignoramus, a would-be fascist and a puppet of Vladimir Putin, have no interest in restricting presidential powers to wage war or bypass due process of law. The only limit they’ve imposed is limitation of his authority to lift economic sanctions against Russia. Election 2016 and the Growing Nuclear Threat by Michael T. Klare for TomDispatch. During the whole of the Cold War, American and Soviet troops never faced each other on the battlefield. Both sides feared possible escalation into nuclear war. If the United States proclaims a “no fly” zone in Syria or sends troops to create a “safe zone” for anti-Assad forces, there is a real danger of a shooting war between the United States and Russia. The United States and Russia are the only two nations with enough nuclear weapons to destroy each other. Presumably leaders of neither nation want this, but who knows what a direct Russian-American conflict could escalate into? And for what? Making Sense of the Russian Task Force Off Syria by The Saker, a pro-Russian blogger. Is the US Headed Towards War in Syria?, an interview with Col. Lawrence Wilkerson, former chief of staff to Secretary of State Colin Powell, on the Real News Network. Looking Ahead: Clinton’s Plans for Syria by Peter Van Buren for We Meant Well. Fact Check: Trump Is Right That Clinton Might Cause WW3 by Carl Herman on Washington’s Blog. The worst thing that an American President could do is to provoke a nuclear war with Russia. I think that, based on her record and rhetoric, Hillary Clinton would put the USA at greater risk of nuclear war than her predecessors. As adviser to her husband in the 1990s and as Secretary of State, she was a voice for war. Her campaign web site is about her credentials as a war hawk. It is no coincidence that so war hawks of the George W. Bush support her for President. Her protege, Victoria Nuland, assistant secretary of state for European and Eurasian affairs, promotes economic warfare and covert warfare against Russia, while promoting regime change in Ukraine and attempting to draw Ukraine and Georgia into an anti-Russian alliance. This is as dangerous as Khrushchev’s placing missiles in Cuba in 1962. Pro-Russian news sources predict war if Hillary Clinton is elected. I think Russian fears are significant because they could be a self-fulfilling prophecy. If you think somebody is poised to attack you, you’re going to be ready to strike at them before they do. The danger of a U.S. nuclear war with Russia is real and growing. The risk is not that an American or Russian President would deliberately start a nuclear war. The risk is that U.S. policy is creating a situation in which a nuclear war could be touched off by accident. During the Obama administration, the U.S. government has cancelled the Anti-Ballistic Missile Treaty, installed a missile defense system in Rumania and is in the process of installing a system in Poland. What is the harm of a defensive system? It is that the ruler of a country with a missile defense system might be tempted to launch a missile attack, in the hope that the enemy’s retaliatory missiles might be stopped. A defense system that is not strong enough to stop an enemy’s first strike attack might be strong enough to defend against retaliation from an attack, since much of the enemy’s weapons will have been destroyed. So, strange as it may seem, setting up a missile defense system can seem like an aggressive act. There is only one nation in the world with the power to destroy the USA, and that is Russia, with its stockpile of 1,800 operational nuclear weapons. Russia would be destroyed in the process, so its leaders would be insane to attempt this unless Russia’s own survival were at risk. Both George W. Bush and Barack Obama have brought this danger closer by extending NATO forces to the borders of Russia, conducting military exercises close to Russia and attempting to draw Ukraine and Georgia into an anti-Russian alliance. The problem is that NATO forces probably could not defeat the Russia army in a war close to Russia’s borders, just as Russia could not successfully defend a Caribbean or Central American country. It’s generally admitted that NATO in Cold War times could not stopped a Red Army invasion of western Europe. That is why the U.S. government has never pledged “no first use” of nuclear weapons. 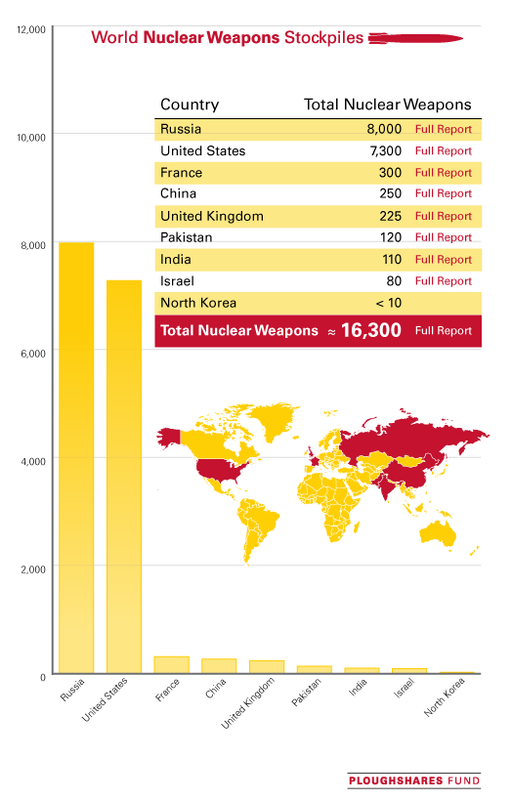 The US depended on nuclear weapons as an ultimate deterrent, and still does. Another danger is that, if Russia’s leaders felt threatened, they might strike first. Or war might be triggered accidentally, as has almost happened many times in the past. Terrorist movements such as ISIS and Al Qaeda are criminal and loathsome, but they do not threaten the existence of the United States. Nuclear war does. Both George W. Bush and Barack Obama took office saying they intended to improve relations with Vladimir Putin’s Russia. The fact that this didn’t happen makes me wonder about the power of the un-elected Deep State that Mike Lofgren and others have written about. Russia, China and now North Korea have renounced “first use” of nuclear weapons. The United States has never done so. I believe North Korea’s leaders because they would be fools to launch a nuclear attack, knowing that their nation would literally be obliterated by the USA in response. They also would be fools to give up nuclear weapons so long as they are threatened by the USA. Only possession of nuclear weapons prevents North Korea from meeting the fate if Iraq and Libya. The United States has never renounced “first use” of nuclear weapons because US conventional forces are not a match for Russia’s in eastern Europe and possibly not for China’s in the South China Sea. The U.S. government seeks to be the dominant military power in every region of the globe. The tools for doing this are sea power, air power, flying killer drones, Special Operations troops and subsidized foreign fighters. But the ultimate backup consists of nuclear weapons, and the power to make a credible threat to use them. So long as this is U.S. policy, no other nation with nuclear weapons will disarm. So long as this is U.S. policy, a global nuclear holocaust is still a possibility, just as in the days of the Cold War. In Midst of War, Ukraine Becomes Gateway for Jihad by Marcin Mamon for The Intercept. Failed states, where governmental authority has collapsed, are ideal venues for warlords, organized crime and terrorists. Ukraine fits the profile. Ukraine’s deputy foreign minister said Kiev is preparing for “full-scale war” against Russia, and is unafraid of nuclear weapons. The Cold War and Ukraine by William K. Polk for Counterpunch. Russia sees NATO forces in Ukraine today as the United States saw Soviet missiles in Cuba in 1962 . What Is Russia’s Answer to Greece’s Plan B – Smile, Blow the Whistle, Pass the Red Card by John Helmer for Dances With Bears. In short, Russia does not intend to bail out Greece. I was at the end of basic training in the U.S. Army in 1956 when the Hungarian people rose up against the Soviet occupiers. 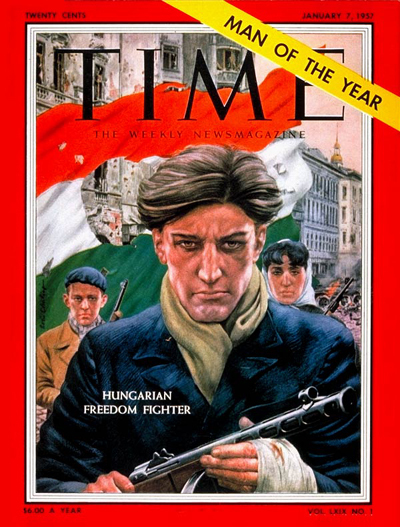 It would have been right and just for President Eisenhower to send me and other young Americans to stand with the Hungarian freedom fighters, especially since their uprising had been encouraged by the Voice of America and Radio Free Europe. It also would have been reckless and foolish, because it could have provoked a nuclear war that would have destroyed the USA, the USSR, Hungary and much of the rest of the world. The USA and USSR still have sufficient nuclear weapons to destroy each other and much else. A military confrontation with Russia over Ukraine would be as reckless and foolish as defending the Hungarian rebels would have been then. A truce, or a freezing of the Ukraine conflict, would not be to the benefit of the Ukrainian people, any more than the Cold War division of Europe was to the benefit of the Hungarian people. Russia would be left in control of its vital naval base in Crimea and with a presence in the eastern Ukrainian industrial heartland. Ukrainians ruled from Kiev would be forced to submit to the IMF’s harsh austerity requirements and to sell national assets at bargain prices. The best that can be said is that it is better than nuclear war. Hat tip to Washington’s Blog. I probably owe my life, along with most Americans, Europeans and Russians who were alive on October 27, 1962, to Vasily Arkipov, a Soviet submarine officer whose name I’d never heard of until this morning. During the Cuban missile crisis, the Soviet Union sent four submarines with nuclear torpedoes to Cuban waters. One of those submarines, the B-59, came under attack from depth charges from an American destroyer. These were dummy charges, intended to make the submarine surface, but Valantin Savitsky, the sub commander, did not know this. He ordered a nuclear torpedo to be prepared for firing at the USS Randolf, a giant aircraft carrier leading the blockade of Cuba. The submarine officers were allowed to launch nuclear weapons on their own initiative. The only condition was that all three senior officers agree. One officer, Vasily Arkipov, refused permission. But for him, World War Three would have begun. I remember the Cuban missile crisis vividly. I was not afraid because it seemed to me that it was all bluff. I did not think either John F. Kennedy nor Nikita Khrushchev would be so crazy as to begin a nuclear war. Only later did I realize how great the danger really was. There have been more close calls since then, when war was averted only by the good judgment of an American or Soviet officer on duty at the time. As long as both countries have nuclear weapons, the danger exists. We can’t count on being lucky every time. We only have to be unlucky once. The USA is now flirting with war with Russia over Ukraine. I do not think either Barack Obama or Vladimir Putin would be so crazy as to begin a nuclear war—not intentionally. But the risk of war is just as great now as it was then. Thank you, Vasily Arkipov, the man who stopped nuclear war by Edward Wilson for The Guardian. A Man You’ve Never Heard of Saved Your Life by “George Washington” for Washington’s Blog. What Stephen F. Cohen & Other Liberals Get Wrong About Obama & Ukraine’s War by Eric Zuesse for Washington’s Blog. Russia is in an economic crisis—the result of U.S.-led sanctions, the Saudi attack on oil prices and the underlying weakness of the Russian economy. With the collapse of the Russian ruble, Vladimir Putin has been backed into a corner with few options—all of them bad. My question is: Is it a good idea to deliberately bring about a crisis in a nation with 8,000 nuclear weapons? Only a small fraction of Russia’s nuclear arsenal would be needed to reduce American cities to rubble. Yet the U.S. government treats Russia with less caution than it does North Korea. I do not think that Vladimir Putin would intentionally launch a nuclear war, any more than Barack Obama would. But I think their policies bring about a situation in which an unintentional nuclear war is highly possible. I think President Obama is more to blame for this than President Putin. For the United States, the stakes are geopolitical advantage. For the Russian Federation, the stakes are the independence of the nation. The United States command and control systems are much more lax than they were in the era of Curtis LeMay and the Strategic Air Command. I don’t know about the Russian Federation, but it wouldn’t surprise me if things were just as bad or even worse over there. Nuclear war was narrowly averted several times during the Cold War through good luck and cool heads both on the US and Soviet sides. The world can’t count on being lucky forever. And even if the worst is averted—this time—the world will never be safe until the world’s nuclear powers disarm, starting with Russia and the USA. The current crisis has eliminated the possibility of disarmament for at least a generation. President Putin is a tough and ruthless statesman, but a sane one. If he is driven from power as a result of the crisis, his replacement may not be so sane. I do not think that President Putin would throw his nation on the mercy of the US-dominated International Monetary Fund for a financial bailout. The history of IMF bailouts shows that they involve a loss of national independence, and public sacrifice in order to pay off international creditors. I think it far more likely that he would throw Russia on the mercy of China. This would throw open Russia as well as Central Asia to be hinterlands of natural resources to support China’s growing industrial power. President Putin some years back, which he was seeking recognition of Russia as a respected great power, proposed an integrated European market stretching from Lisbon to Vladivostok. That’s no longer on the table. Now the most likely prospect is a Chinese-dominated integrated Eurasian market stretching from Beijing to Berlin. Russia Tries Emergency Steps for Second Day to Stem Ruble Plunge by Ksenia Galouchko, Vladimir Kuznetsov and Olga Tamas for Boomberg News. It’s Not Just Oil and Sanctions Killing Russia’s Economy: It’s Putin by James Miller for The Interpreter. The bleakest winter by Ed Conway for Medium. The six downward steps in a typical currency crisis. Russia is at step four. NATO expansion into Ukraine would open Russia to the threat of invasion. It would bring an anti-Russian army almost as close to Moscow as Hitler’s armies got in two years of fighting. For the first time in modern history, Russia’s vast distances would cease to be a guarantee of safety against invasion. Of course NATO is not the equivalent of Hitler’s New Order, and I don’t imagine that the proponents of NATO expansion actually intend to invade Russia—only to weaken Russia by making it vulnerable. But of course Russia would still have its nuclear arsenal. Russia’s nuclear arms make it the only nation in the world that might be able to physically destroy the United States. It is a very bad idea to back Russia’s rulers into a corner in which this is a consideration. Ukraine’s inhabitants have as much right to be an independent nation as anyone else, and they have reasons to be wary of Russia. Tsarist Russian suppressed Ukrainian culture, Stalin’s policies caused the deaths of millions of Ukrainians from starvation and in the Gulag, and Russia is under the sway of extreme nationalists who hold Ukrainians in contempt. A new law allows Russia to grant citizenship to anyone born within the boundaries of the old Soviet Union, provided they speak Russian. Ukrainians recall how Hitler annexed the Sudetenland, the border area of Czechoslovakia, on the excuse of protecting the German-speaking population there. 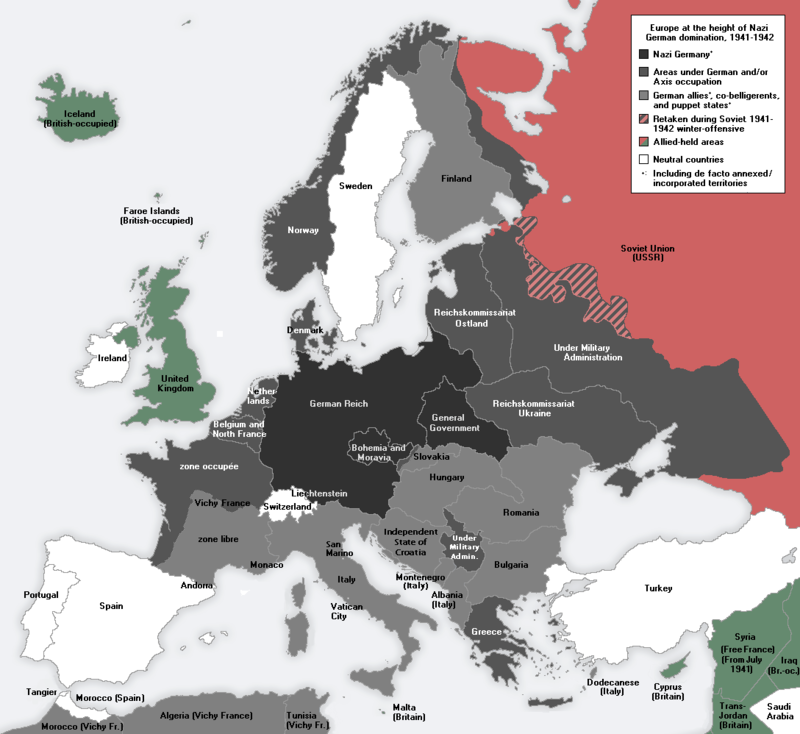 The annexation left Czechoslovakia defenseless, and unable to resist Germany’s annexation of the whole country. Ukrainians say this is parallel to how Russia annexed Crimea with the excuse of protecting the Russian-speaking population there, and might try to annex western Ukraine with the same excuse. But from the Russian point of view, the Ukraine as a whole is Europe’s Sudetenland. On the pretext of protecting the independence of Ukraine, NATO would put itself in a position to threaten the very existence of Russia. I don’t think the USA or its NATO allies actually intend a land invasion or would be capable of carrying it out if they tried, although they might help rebels in Russia to destabilize the Russian government. But the point is not what I think, or even what is the case. The point is what Russian leaders think and how they would react. We were in greater danger from nuclear weapons than we thought during the Cold War era, and that danger still exists. 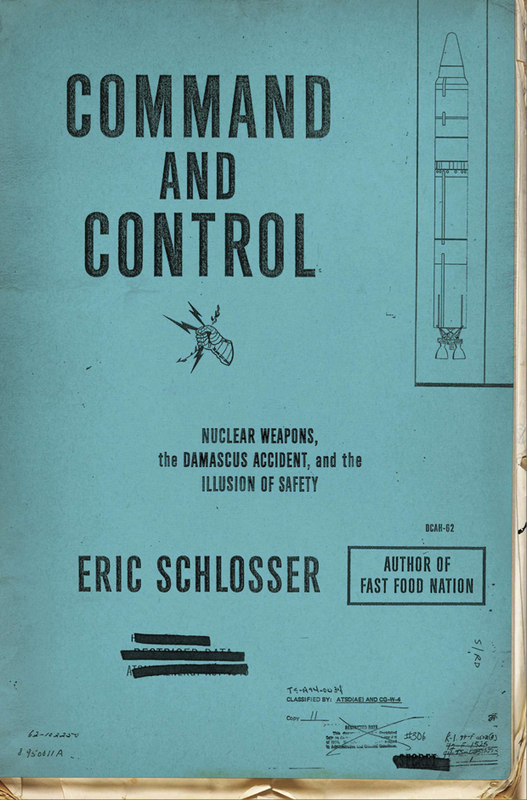 That is what I learned from reading COMMAND AND CONTROL: Nuclear Weapons, the Damascus Accident and the Illusion of Safety by Eric Schlosser, a history of nuclear weapons technology from World War Two to the present. The danger was not so much that the USA or USSR would intentionally start a nuclear war. Deterrence did work. The danger was an accidental discharge or launch of a nuclear missile. As Eric Schlosser documented, this nearly happened literally hundreds of times. Evidently nobody knows the actual number because the U.S. government doesn’t keep a list. Even Robert Peurifoy of Sandia Laboratories, the leading advocate of safer nuclear technology within the government, didn’t know of all of them. The book has two narrative threads. One is the evolution of nuclear weapons and nuclear strategy from FDR to Reagan, the technical and engineering difficulties, and a relentless piling up of reports of bomber crashes, accident bomb drops, computer system failures around nuclear weapons and weapons being lost or left unguarded. We’ve been on the brink of nuclear war and nuclear disaster many more times than we know. The other thread is an hour-by-hour report on a near-disaster a Titan missile complex near Damascus, Arkansas, in 1980. I had not thought of missile crews as brave in the sense that fighter and bomber pilots are brave, but the missile crews deal with dangerous and not completely predictable forces. The accident began when an enlisted man, performing routine maintenance near the top of the missile, accidentally dropped a socket, which punctured the oxidizer tank of the lower stage. Both the oxidizer and the fuel are toxic as well as highly flammable and explosive. If the air pressure in the oxidizer tank were to fall below a certain level, the tank would collapse and the rocket fuel would explode. The rocket carried a nuclear bomb with the explosive power of all the bombs dropped during World War Two, including the bombs dropped on Hiroshima and Nagasaki. The following few hours were a story of bureaucratic paralysis and individual heroism as a fire broke out in the complex and the rockets eventually exploded despite everything the crew could do. It was only by good fortune the nuclear warhead was not detonated. The U.S. nuclear arsenal, both as a whole and in its individual parts, is an example of what the writer Nassim Nicholas Taleb calls a fragile system. The failure of any of its parts would have led to the cascading failure of the whole system. Nuclear strategy for 40 years was based on the “Single Integrated Operational Plan,” which was an all-out attack which would have taken the lives of an estimated 200 million people in Russia, China and eastern Europe. Some U.S. military leaders actually contemplated launching such an attack which would have taken the lives of more people than were killed by Hitler, Stalin and Mao combined; presumably the Soviets had a similar plan. Robert McNamara, Henry Kissinger and others sought alternatives. Their efforts were unsuccessful for, in my opinion, good reason. If the leaders of a nation are going to use nuclear weapons at all against an enemy which also has nuclear arms, it is too late to hold back. Schlosser gives great credit to General Curtis LeMay, who commanded the Strategic Air Command from 1948 to 1957 and higher Air Force positions through 1965, for his strict insistence on proper procedures and checklists and tough unannounced inspections. It was said of LeMay that he did not distinguish between the unfortunate and the incompetent, and that to err is human, but to forgive is not SAC policy. This tough attitude saved many lives, Schlosser said. The situation is different now. In 2003, Schlosser reported, half of the Air Force units responsible for nuclear weapons failed their safety inspections, despite three-day advance warnings. 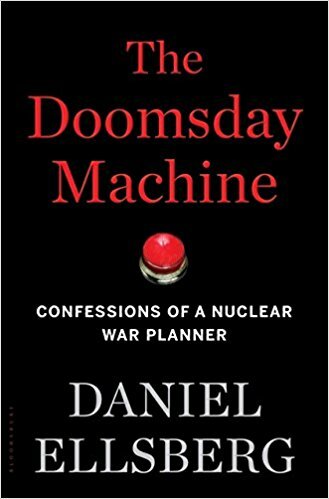 Schlosser pointed out that the United States has never had an unauthorized detonation of a nuclear weapon—a remarkable achievement. But each day that nuclear weapons exist is a gamble that a detonation won’t take place. Meanwhile nuclear weapons proliferate. India, as Schlosser noted, has double the industrial accident rate of the United States, and Pakistan has three times the rate. How long until one of those weapons goes off? And then what? My previous post was about Philip Wylie’s 1954 novel, Tomorrow!, about a nuclear attack on the United States, which ends with massive retaliation wiping out two-thirds of the population of the Soviet Union. It reminded me of a 1947 short story, Thunder and Roses, by Theodore Sturgeon, a less renowned, but more gifted and original, writer, also about the United States in the aftermath of a nuclear attack. In Sturgeon’s story, the United States was wiped out in a first strike, and the remnants of the population are doomed to die by radiation poisoning. The means of retaliation still exist, however, if someone can find them. The result, however, would be to raise the total level of background radiation to such a level as to destroy all life on other. A beautiful and beloved singer and movie star is traveling across what’s left of the USA to try to persuade the survivors to not retaliate. She begins her performance with her signature song, which is a reminder of all the reasons that life is worth living. She then makes her plea against taking justified revenge. The spark of humanity can still live and grow on this planet. It will be blown and drenched and shaken and all but extinguished, but it will live if that song is a true one. It will live if we are human enough to discount the fact that the spark is in the custody of our temporary enemy. Some—a few—of his children will live to merge with the new humanity that will gradually emerge from the jungle and the wilderness. The protagonist then discovers the secret missile installation from which massive retaliation can be launched. His best friend tries to fire the missiles. The protagonist (apparently) kills him to stop him, destroys the installation so that the missiles can never be launched and then sits down to die. A decade later the anti-war Russell-Einstein manifesto called upon the peoples of the world to “remember your humanity and forget the rest.” Philip Wylie’s novel Tomorrow!, which describes a U.S. victory through nuclear genocide, is a reminder that the best of us can forget our humanity. Theodore Sturgeon’s novel reminds us that it is always possible to remember your humanity. 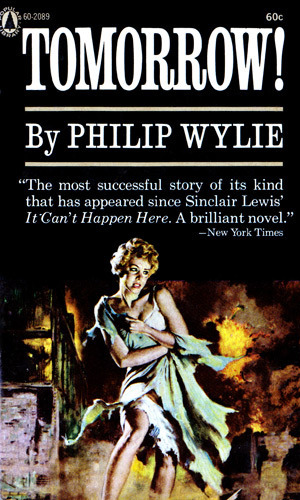 A friend of mine recently lent me a novel about World War Three as imagined in 1954 by Philip Wylie, an author who is virtually forgotten now, but famous in his time for his iconoclasm about American political, social and sexual taboos. Tomorrow! was enjoyable to read, and a reminder of a very real danger which we escaped. He wrote Tomorrow! to advocate for a better U.S. civilian civil defense program. The characters live in twin fictional Midwestern cities, resembling Kansas City, Kansas, and Kansas City, Missouri. One city has a functioning civil defense program; the other does not. Wylie sketches his characters, and their struggles and hypocrisies, as in a Sinclair Lewis novel, and then the atomic bombs fall, and their reactions reveal their characters, as in a Hollywood disaster movie. The characters who support and participate in civil defense are self-defined liberals. The main opponent is a wealthy businesswoman who admires Senator Joe McCarthy and thinks the real Communist enemy is within. 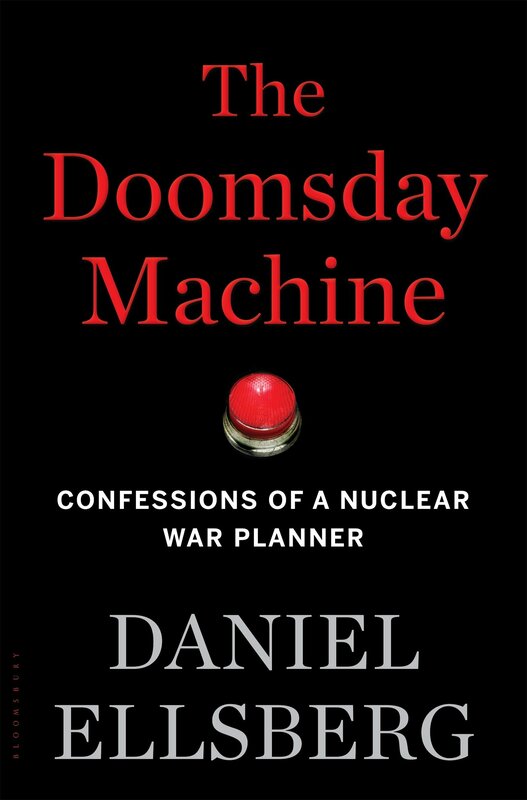 The climax is that the surviving members of the U.S. government decide to unleash their secret Doomsday weapon against the Soviet Union—a superbomb in a nuclear submarine on a suicide mission in the Baltic Sea. The rays, the temperatures, vaporized Finland’s Gulf in a split part of an instant. The sea’s bottom was melted. The Light reached out into the Universe. Finland (!!) was not. Lithuania, Latvia, Estonia, they were not. Kronstadt melted. Leningrad. … On the wind currents … a thick dust that widened to a hundred miles and then five hundred, moving, spreading, descending, blanketing the land … The further it surged from the reshaped Finland Gulf, where the sea had come sparkling back, the longer men took to perish. But they perished. … Men swallowed, ate, breathed, sickened and died in a day, a week, two weeks—men and women and children, dogs and cats and cattle and sheep, all of them. … There was no refuge from the death, it took them all, the birds of Arctic winter, the persistent insects who had survived geologic ages, the bacteria—all. Everyone in the USSR dies except a remnant in its southern fringes. Although this is a greater mass slaughter of human beings than carried out by Hitler, Stalin or Mao, it is regarded as a happy ending in the novel. The last great obstacles to freedom had been removed from the human path. We then see scenes of rebuilding, with Americans, instead of being condemned for having committed history’s greatest crime, receiving foreign aid from a grateful world. Of course this was only fiction, but it is sobering to think about what was regarded as acceptable thinking back then, and how easy it is to accept enormities as normal. I first read the novel back in the 1950s. I don’t remember my exact reaction, but I was not as appalled as I should have been. Theodore Sturgeon, another writer of that era, had a similar theme, but opposite conclusion in his 1947 short story Thunder and Roses. I’ll write about this in my next post.